We have officially entered our busiest season of the year! How is it that time already?! Sara and Robby’s National Golf Club wedding was the perfect way to start it off. Their wedding was so full of love and family – you could just FEEL the love from everyone towards this bride and groom! Tony and I really enjoy getting to know the families of the couples that we’re working with. We get to see these families in such an intimate environment, and we consider that such a privilege! One of our favorite moments of Sara and Robby’s day was seeing Sara and her father dance their daughter/father dance to a song that Sara’s dad actually recorded!! How sweet is that!! Another aspect of the day that we thoroughly enjoyed was realizing that it wasn’t just Sara’s dad who had great vocals. SARA also recorded a song for everyone to dance to as well!! It was no surprise to us that music was going to play a huge part in this wedding because Sara is a very talented singer! Sara planned their day so perfectly. From the bridal details to the fireworks at their exit, it was all so stunning! The florals, the limo, the gold cake, her rosary…. she did so much to make their day unbelievably unique and special! It was such an honor to be the ones capturing their beautiful moments and stunning details. 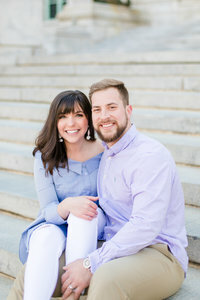 Robby and Sara, we know you left yesterday on a jet plane and we wish you safe travels and the most incredible honeymoon! You deserve it!!! Thank you for allowing us the honor of being a part of your wedding day!!! We love you both!